Expand your knowledge, skills, and enjoyment of sewing, quilting, and embroidery. Hands-on classes brought to you by the industry's leading educators. Learn new and innovative techniques in a fun-filled, team sewing environment. Test drive the latest machines, win prizes, take advantage of factory direct savings. Take a look at the fun from last year. The new EMBELLISH™ concept brings new product technology and techniques that complements today’s embroidery revolution. The EMBELLISH™ line includes new uniquely modern products that range from premium stabilizers and threads to software. Embroidery designs range from big to bigger, fitting into our largest hoops, and EMBELLISH™ premium stabilizers are made to hold substantial stitch-count designs with ease and are perfect for today's bold embroidery. Join Hope on Friday evening, October 12th, from 5:30 p.m. – 7:00 p.m. for a meet and greet, photos opps, trunk show and lively stories that will have you laughing in your seats. This is free with any single day registration at the Fall 2018 QES Creative Expo. Hope will be teaching the“Merry & Bright” project each day of the QES Creative Expo and we will have the entire line of her embroidery designs and EMBELLISH™ products at the event. Enjoy the use of the new Brother Luminaire Innov-is XP1 as you make a dramatic and warm addition to your holiday home this year and every year with our Merry & Bright embroidered stocking. Two winter appliqués are up-scaled using heat transfer foil providing a sophisticated shimmer that pairs perfectly with EMBELLISH™ Matte embroidery thread. Quilting in-the-hoop, using new automated echo quilting functions built into the machine, adds texture and function. The cuff is trimmed with chenille and snowflakes are randomly added using Projector technology to preview perfect placement. Finished stocking size is 16” x 10”. Whether your passion is quilting, embroidery, sewing or digital cutting, this project is filled with the lasted techniques using the newest technology perfect for beginners to seasoned sewists. Everything will be provided for the event from the use of the newest machines to the latest threads, food, and fun! Create this attractive and useful clutch using a variety of techniques that include sewing with cork fabric and vinyl, decorative stitch embellishment that will truly amaze you, ribbon work, a unique floating stitch technique and even stitch creation. This class will expand your sewing skills tremendously. We will provide a machine for each student to use. Gina has a passion for sewing, quilting and all things embroidery. This combined with her love of teaching others makes her a great educator and a beloved teacher wherever she goes. Gina’s desire to create and encourage others to explore their own creativity shows in her enthusiasm and skill in the classroom. Her philosophy is simple: “We should all be having fun, or we shouldn’t be doing it.” Gina is an award-winning quilter with her very first quilt taking Best of Show. She has been published in “Jenny Haskins A Place in the Sun” and most recently “Classic Sewing.” Gina has a background in Interior Design and Business Management, as well as accreditations with Jenny Haskins and Martha Pullen. Event goers always look forward to Gina’s next visit whether it is a sewing or a trunk show full of inspirational samples that get everyone excited about all the possibilities. Gina’s Specialties include: Embroidery, Quilting, 16” Machine Quilting, Fine Linens, Home Décor, Doll making and Teaching. In the first class you will create a custom tote bag with a lining, zipper, pockets and handles. 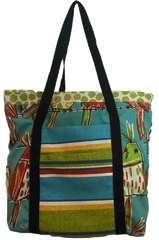 You will learn firsthand how to insert an invisible zipper and use new techniques for top stitching while constructing this attractive tote bag that will be great for taking to class or traveling on a plane. In the second class you will construct this useful caddy. The caddy sits under the serger or machine, with the pockets hanging down to hold tools and even some trimmings. Learn how to use decorative threads, stitch edging, chain stitch quilting and the cover hem pocket construction. You will also sew with piping while constructing this fun sewing caddy. Registration begins at 8 am and is first come first served. You will be contacted if your registration request for classes and days cannot be fulfilled due to capacity. See what others have to say about the event. We asked our attendees what they enjoyed most about the QES Event.